The holidays tend to be a time overflowing with traditions. May that be a specific meal or dessert your family serves or a specific place your family always gathers. 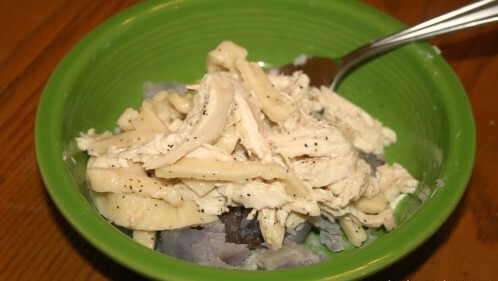 For my husband’s family homemade noodles with chicken over boiled potatoes on Christmas Eve at his mom and dad’s is a tradition we all look forward to. My mother-in-law makes the most delicious homemade noodles with chicken. While sitting at the table on Christmas Eve, I realized I had never attempted this dish before. After my husband made a comment about how it was too bad that we only eat this meal once a year, I knew I had to try to make it at home. The temperature here in Omaha has been several degrees below zero for what seems like the past month, with last week finally giving us a must needed reprieve with temperatures near the freezing mark. With all this cold weather I figured no time like the present to try to make this dish. After shoveling snow (and giving myself a fat lip with the shovel handle) I knew that homemade noodles with chicken would be the perfect meal to warm me up. I am warning you that this isn’t an impulse dish. After the noodles are rolled and cut, they need to dry for two hours, so plan accordingly. I have made homemade egg noodles in the past, using my Great Grandma Dorothy’s recipe. When making the noodles this time I had forgot all about her recipe and used one from an old cookbook (which I will post about later since after googling it I learned it is worth more than the $4 I paid for it at the antique store). My mother-in-law makes her homemade noodles with chicken using chicken broth to add moisture. I used boneless/skinless chicken breasts, which I thought were slightly dry. I thought the noodles and chicken needed something a little more substantial than broth to bring it together; so I mixed up a little chicken gravy and added it to the dish. It brought it together nicely. This dish was very warm and comforting on cold Nebraska night. Knead dough until as smooth and elastic as possible, about 5 minutes. Roll out on a lightly floured board (I just floured my counter top). Use the rolling pin from the outer edges toward the center, turning the board as necessary for easier rolling. Drop by handfuls into boiling soup or boiling, salted water (I used chicken stock) for 10 minutes. Strain, reserving 2 cups chicken stock. Put chicken into pot, add enough water to cover chicken. Bring chicken up to boil. Once boiling put lid on pot, take off heat. Let sit 7-10 minutes before removing the chicken. Melt butter in pan over medium-high heat. Stir in flour and cook for a couple minutes. Slowly whisk in the chicken stock. Simmer until gravy thickens. Combine shredded chicken and noodles. Pour a little gravy over and toss to combine. You want just enough gravy to coat the noodles and chicken. Serve as is or with boiled potatoes. (I used boiled purple potatoes) Season with salt & pepper. I made this tonight as a first attempt at noodles. They were tasty; however, my noodles ended up a little on the chewy side. I doubled the recipe; and as mine were not done at 10 minutes, I let them go 15-20. Suggestions for a softer noodle? Tiffany: These noodles are toothsome –even while fully cooked they will still be slightly chewy. I don’t have a pasta roller so I can’t say for sure, but maybe rolling them really thin would make for a softer noodle. I’m sorry I can’t give you a better answer. That’s about what I suspected; just wanted to make sure I didn’t miss anything. Thanks! I have made homemade pasta once with a past roller. I rolled the pasta more than required. . . It said once for each setting width. They were very chewy. My mother, standing by kept telling me to cook them longer. When I did they became softer. It seems it took forever to cook them soft. She thought I had rolled them too much.